ANONYMOUS - [ LANDSKROON ]. 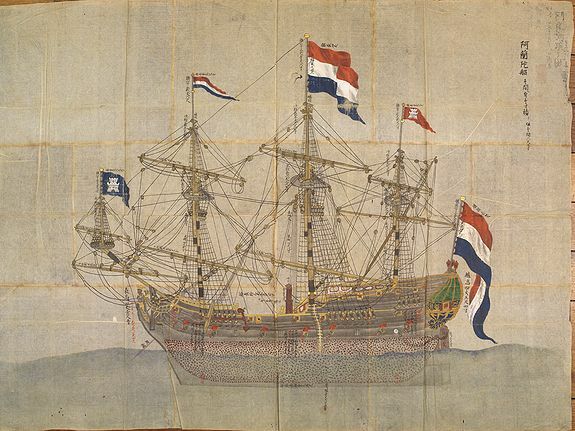 Oranda Fune no zu [= Depiction of a Dutch Ship]. Title : [ LANDSKROON ]. Oranda Fune no zu [= Depiction of a Dutch Ship].. Date : Japan, Kansei 4, 2nd month, 9th day, 30 March? 1792. Size : 32.3 x 44.5 inches. / 82.0 x 113.0 cm. Colouring : In original colours. Description :A very large and extremely detailed Japanese drawing on rice paper of a Dutch ship at the artificial island Deshima, the VOC's outpost in Nagasaki harbour. In the drawing, the ship itself measures about 63 cm from figurehead to stern, giving a scale of about 1:47. The Japanese texts do not identify the ship, but note that it was at Deshima on Meiwa 3, 10th month, 18th day, which is in October or November 1766, probably 21 October. The VOC ship database" records only one ship at Deshima in 1766: the "Landskroon", which arrived from Batavia on 13 August 1766 and departed for Batavia on 8 November 1766. The drawing is so meticulous, especially for the masts and rigging (showing every detail, labeling the parts in Japanese, and even giving their dimensions) that it seems likely to have been made as a construction drawing, perhaps by Japanese studying Dutch shipbuilding. The chimney of the caboose or galley is clearly depicted before the mid mast. The figurehead is a black-skinned man or boy in a feather headdress and feather skirt, such figures sometimes representing Africa in maps of the continents or in sculptural or architectural decoration (see, for example, Maritieme Geschiedenis der Nederlanden III, p. 263). The ship "Landskroon" was built in 1664 and first sailed from Texel in the Netherlands to Batavia. It sailed to Batavia several times and to Ceylon in 1773, and was dismantled in the East Indies in 1780. In 1766 it sailed under (Michiel?) Wargijn, Herman Christiaan Kastens and Jan Crans. The VOC database does not specify the type of ship but notes its capacity as 1150 ton, and the registers of VOC ships departing from the Netherlands note it in 1764 and 1772 as a 150-foot (42.5 meter) ship carrying 339 or 322 men. This is consistent with the drawing, which shows a square-rigged three-masted ship with 52 guns, apparently a large "Spiegelretourschip" (East Indiaman): the 52-gun "Nagelboom," for example, measured 143 feet. The ship is shown flying three red, white and blue Dutch flags. The other two flags are more of a puzzle. The white chess-rook style tower on a red ground must have been intended as the flag of Middelburg (whose tower should be gold rather than white), but the ship "Landskroon" sailed for the Amsterdam Chamber of the VOC in all its other voyages, not the Zeeland Chamber in Middelburg, and Michiel Wargijn sailed for the Amsterdam Chamber in 1767 (the database does not record the chamber for the 1766 voyages to and from Deshima). We have not identified the flag at the prow, which shows a nearly identical white tower, but on a blue ground. We were not able to find other Japanese paintings or prints showing flags with other than the VOC-Amsterdam standard. ! The painting must have been copied from a source more or less around the date when the ship was in Deshima, - Meiwa 3, 10th month, 18th day (21 October? 1766). We have not located the original 1766 painting, so this drawing may be the best surviving record of the ship "Landskroon", besides being a remarkable source of information about Dutch-Japanese cultural exchange. The rice paper used for the drawing was assembled from ten smaller pieces before the drawing was made. There is a red Japanese library stamp on the reverse. It is in very good condition, with only minor wear along some old folds. A large and remarkably detailed measured Japanese drawing of the VOC ship "Landskroon" at Deshima in 1766. Rangaku, literally "Dutch Learning", and by extension "Western learning") is a body of knowledge developed by Japan through its contacts with the Dutch enclave of Dejima, which allowed Japan to keep abreast of Western technology and medicine in the period when the country was closed to foreigners, 1641-1853, because of the Tokugawa shogunate's policy of national isolation (sakoku). Through Rangaku, Japan learned many aspects of the scientific and technological revolution occurring in Europe at that time, helping the country build up the beginnings of a theoretical and technological scientific base, which helps to explain Japan's success in its radical and speedy modernization following the opening of the country to foreign trade in 1854. Condition : An extremely large and detailed Japanese ink drawing on rice paper of a Dutch ship identifiable as the VOC ship "Landskroon" at Deshima island in Nagasaki Bay in 1766. In Stock - Click here to How to buy. We warranty the authenticity of each map, print, atlas or medieval manuscript described in this catalogue. There is no time limitation to this garantuee. If the condition report does not show remarks about splits, tears, discolouration, etc; this means there are non to be found in the item!. As a general rule we try to offer maps of a high quality standard. - Any map, print, atlas or medieval manuscript differing from the catalogue description may be returned for a full refund. - A certificate of authenticity is provided for each acquired map, print, atlas or medieval manuscript.